Garcia is an assistant professor in the Department of Biology in the College of Arts and Sciences. 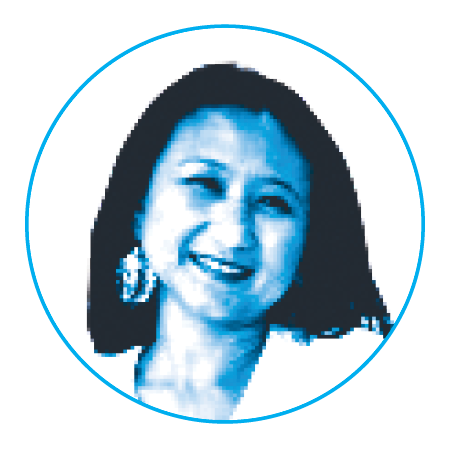 She specializes in cellular and molecular neurobiology. A patient regains consciousness after a devastating accident to learn that his spinal cord has been crushed and he may not walk again. A soldier suffers from memory loss after being struck with shrapnel that enters his brain. An elderly patient succumbs to the confusion and jumbled speech of early Alzheimer’s. While the precipitating neurological damage in each of these examples is distinct, in each case, the central nervous system unleashes a chain of biochemical and cellular responses that irreversibly destroys the brain’s neurons. Why can’t the nervous system heal itself the way other parts of the body do? To answer that question, researchers are studying how central nervous system cells respond to injury. 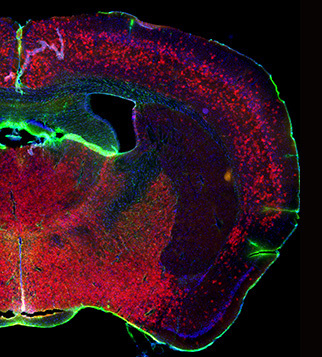 Transgenic mouse brain showing astrocytes in red. Garcia’s lab utilizes conventional and advanced microscopy of fixed and living tissues to study how astrocytes respond to injury. 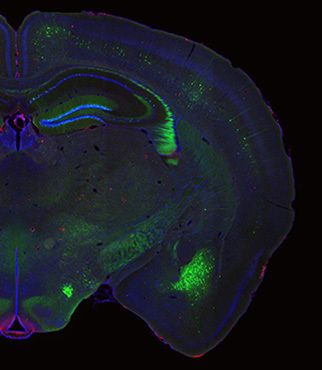 Transgenic mouse brain in which a subset of neurons are selectively expressing green fluorescent protein. The Garcia lab studies how astrocytes regulate the organization and function of neuronal synapses. Drexel neurobiologist Denise Garcia has focused on relatively under-studied cells called astrocytes. Astrocytes are a type of glia cell, so named because they were once regarded as mere “glue” that provides structural support to neurons. Historically, they’ve been overlooked by neuroscientists, but that’s starting to change. Garcia believes they are more than just support staff. For one thing, higher species have a higher ratio of glial cells to neurons. Leeches have one astrocyte for every 30 glial cells. Rodents have one for every three. Humans are believed to have a ratio of one to one. It has been estimated that astrocytes are the most numerous cell type in the central nervous system, and some neuroscientists believe that the ratio has increased across evolution to facilitate increasingly complex cognitive tasks. Indeed, astrocytes are now known to be an important component of synaptic formation and communication between neurons. When it comes to injury, astrocytes wear both white and black hats, and their role isn’t trivial. When the central nervous system suffers trauma, astrocytes are known to release inflammatory molecules that can interfere with healing. In severe cases, they proliferate and form a “glial scar,” like an internal scab, that neurons can’t bridge, which in the case of spinal cord injury results in permanent paralysis. However, they also serve a helpful role by forming web-like enclosures around macrophages that would otherwise infiltrate an injured area and destroy neurons. How does this one cell type do these disparate things? It’s a question Garcia has been pursuing in her lab at Drexel.